This past weekend I finally had to ditch the shorts. I’ve been in denial for a few weeks and kept countering those cold morning legs with layering up top but last Friday I gave it up and put on the sweats. Now that doesn’t mean we won’t get a few more fall opportunities to bare those gams, perhaps even later this week, but for now, the word of the day is “chilly.” 26 degrees here in Markleeville this morning! Last week we had just under .10 inches of rain but this week is expected to be clear. So, if you’re thinking about a visit to the Sierra you’ve still got some time to get one in! The fall foliage is here and is outrageous in some areas; Mammoth and Hope Vally to name just a couple. What do do, what to do? 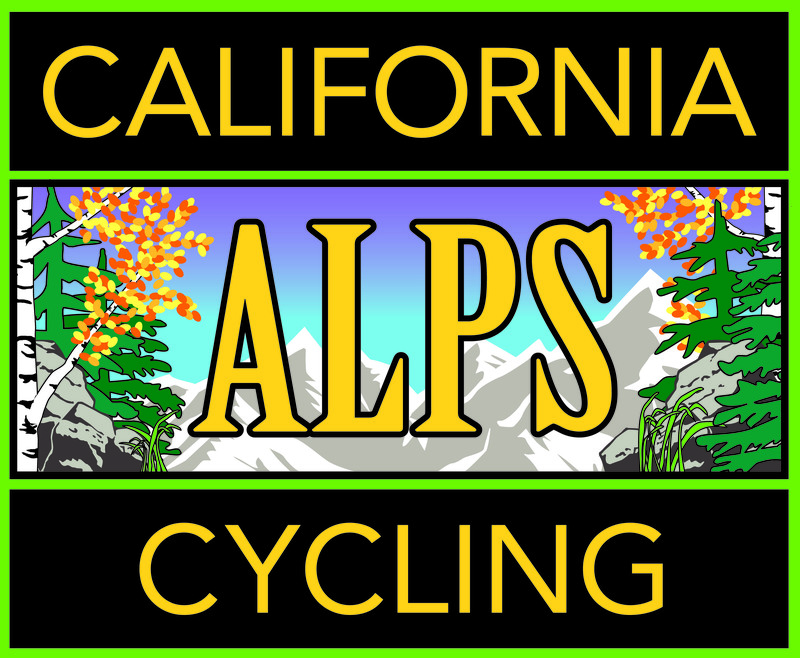 The California Alps cover a lot of real estate so from Mammoth to Lake Tahoe you’ve got many choices. Hiking, hunting, fishing (rivers and streams are open until next month), mountain biking and of course, cycling. There’s also major opportunties for picture taking or other artistic endeavors. The Los Angeles Times pubished an article last month about our little town of Markleeville, and it had some good suggestions as well. Click here to check it out. Speaking of Lake Tahoe, here’s a pic of member Chris Schull enjoying a beauty day at the lake a couple weeks ago. Last week I decided to get off the trainer and get outside even though we had some rain slicked roads. I was sticking with the trainer because I just didn’t want to wash the bike, but among other things I really needed that feeling of the wind rushing through my helmet vents (no hair, other than my beard, for it to rush through). I thought I may catch a break and get back before the rain came but alas, no such luck. That will teach me to not wear those rain boots! No worries, though. Quick rinse and re-lube of the bike (Roscoe is his name), some newspaper stuffed in the Sidis, a hot shower and we were good to go. These pix were taken about 10 miles up Ebbett’s Pass (from Markleeville) and you can just see some of those fall colors staring to pop. Remember, you can always get real time weather conditions here in the heart of the California Alps. We’ve got a weather station right here at HQ and just recently we’ve added an AQI unit so you can get that information as well. Go to our “Weather Conditions” page and check it out! Whatever you decide, we hope to see you soon and remind you to be safe out there and don’t do anything outside your capabilities. You still have time, though, to Kick Some Passes’ Asses!™ and then enjoy some of the myriad other things that these California Alps have to offer! It seems to me that since I’ve lived in Markleeville, Wolf Creek Road has been closed. That’s not to say I haven’t been back there (shhhh…). I have. I’ve taken a few rides in and a done a few hikes as well. There was a massive slide during the winter of 2016/2017 and so access by car was not possible. Frankly, there were times that it didn’t seem it was wise to access it by bike either – too much mud, rocks and run-off. Nonetheless, I tried, but alas, getting to the Meadow was not even possible. So, after weeks of dirt-haulers coming in and out, I was encouraged. And then recently, bam! the gate was opened and so I was able to ride “that segment” with impunity. However, about 2 miles or so past the gate, the road was just too rough to continue on the bike, so I made a mental note to come back, with the wife ideally, and explore. Last weekend, I did just that! Loaded up the chairs, the cooler, the fishing gear and most importantly, my wife, Patricia, and off we went for an afternoon recon. Access Wolf Creek Road from Hwy. 4, about 8 miles south of Markleeville. On the way out we spent quite a bit of time checking fishing spots and trying to figure out the best way to get to them but in the end, decided to just keep on truckin’ to the Meadow and then work our way back. It was a bit smokey in some areas due to the Ferguson fire near Yosemite but as you can see, the meadow is an amazing place. We also explored some of the spur roads in the area that lead to various trailheads in the Carson-Iceberg Wilderness. Something else to do in the future – backpacking! Once we got to the end of the road, literally, we stopped and enjoyed the Creek. I did a bit of fishing (no catching unfortunately) and “momma” read her book and took a little nap. We stopped and hit a few other holes on the way back to Hwy. 4 but again, no catching. Still, if you’re looking for a little day trip, close to Markleeville, this is one I highly recommend, especially once the smoke clears. I’ll leave you with a couple pix from one of “those 2016/2017 winter hikes” I mentioned earlier in this post. Take a trip out there! You won’t regret it. Looking upstream (southeast) at Wolf Creek from the road.